Sean Murphy's Batman: White Knight is the kind of Elseworlds-esque story that has the potential to fundamentally change our ideas about the Dark Knight in a way that's bigger than any one comic book, TV show or movie. Now that the series has come to a close, we take a look back at what made it great and where it took some big missteps. While Bruce Wayne is a specific character who appears in many of DC Comics' titles, Batman has become something far more interesting: A malleable and ever-changing idea about justice, violence, power, dysfunction, and all the ways in which those things interact with one another. In his fictional adventures, Batman's a billionaire, crack detective, and one of the most brilliant minds in the multiverse. Here in the real world, though, he's a symbol that represents the fantasies we all have about the people we could become and the things that we could do if given the right resources and opportunities. It's that desire to be like Batman that's always made it easy to identify with and cheer for him. That stays true, even when different creators have taken the Dark Knight to shadowy, questionable places meant to make you reconsider just how heroic (and sane) he actually is. 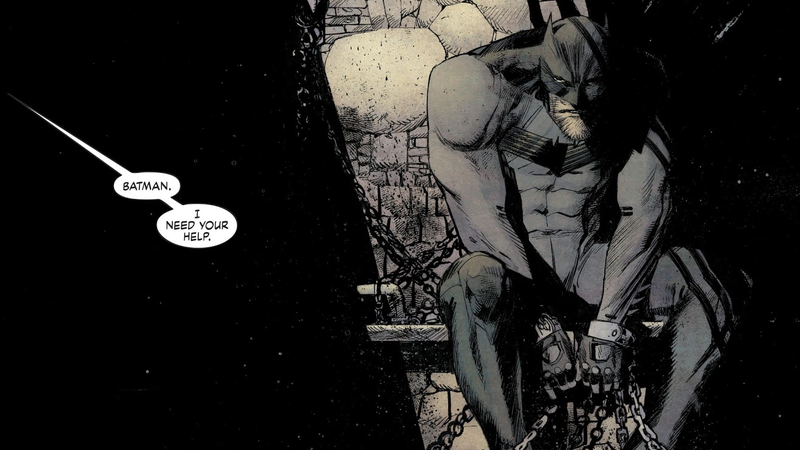 The idea of Batman being the true source of Gotham's ills is not new, but Batman: White Knight elevates it by taking that premise and making it explicit where most other stories have merely implied it. White Knight is set into motion when, after Batman and the Joker tear through Gotham on a particularly violent car chase, a number of people watch and record as a seemingly-mad Batman nearly beats the Joker to death. As Batman beats him to a bloody pulp, the Joker insists he can give up his villainous ways if given the chance to take a new medication that can keep his sanity in check. The caped hero begrudgingly agrees to give his archnemesis a chance... by forcing fistfuls of the pills into the Joker's mouth. It's clear that Batman's trying to kill the Joker because while he's choking on the pills, the villain manages to say that he can't breathe, a moment meant to echo Eric Garner's death in 2014. Videos of Batman and the Joker's altercation quickly spread across the internet, creating a groundswell of support for Jack Napier, the reformed Joker who quickly gets down to business with his latest plan: Becoming Gotham's newest city council member and finally putting Batman behind bars. Narratively, this has all the makings for a nifty, but familiar sort of Batman story, but White Knight pivots by making it clear that Napier's plan isn't just another one of the Joker's ploys. His reform and desire to restore Gotham is earnest and while the public is initially sceptical of him, in time, they come to see Napier as the sort of champion that they have always needed. In his neverending quest to save Gotham, Batman's fight became a crusade against supervillains, but Napier makes the compelling argument that the real problem plaguing the city is its rampant corruption. It's with the promise of a Gotham where the police aren't corrupt and the politicians actually do their jobs that Napier is able to win hearts and minds - and Batman's arrest is, in its way, the cherry on top. It's Napier's need to bring Gotham's citizens over to his side that makes White Knight such an interesting idea for a comic, but the way it's depicted in the story is ultimately where it really fails to stick the landing. Napier knows that even with his Joker days behind him, there's no way for him to drum up political support among Gotham's rich elites who he once regularly imperiled for shits and giggles. So, he turns to Backport, the predominantly black, working-class borough that Gotham PD has a history of ignoring. Napier allies himself with Duke Thomas, a former military officer turned cop who formed a pseudo-militia of his own, composed of former gangs that now maintain an uneasy peace in Backport. From Napier's perspective, his and Duke's enemies are one and the same, because Batman is essentially an unofficial extension of the GCPD who've failed Backport - and Duke can't disagree. With his backing, Napier's able to successfully launch his bid for the city council and White Knight moves along, not really bothering to unpack just what Napier's political career means both within the context of the story and for the comic as a piece of social commentary. Napier goes to Backport because he sees an opportunity to appeal to be the de facto leader of Gotham's minority population and secure their votes. He meets a community leader, gives a speech, and even builds a new library (which he later destroys in secret - it's a long story), and White Knight suggests that's more than enough to see him as a hero. This doesn't really make sense. Though the Joker's madcap chases with Batman might not have brought him into places such as Backport as often as they did downtown Gotham, it isn't as though the people living in Backport were completely untouched by villains like the Joker. One speech from Duke and a library shouldn't really be enough to convince an entire community of people who once lived in constant terror of the Joker that they should suddenly see him as their saviour. White Knight is very much a comic that's trying to comment on the ways that corruption and police brutality harm people from communities that need protection the most. Here, Batman is depicted as the out-of-control blunt instrument that Gotham PD knowingly lets operate in the city, even though he poses a significant threat all on his own. 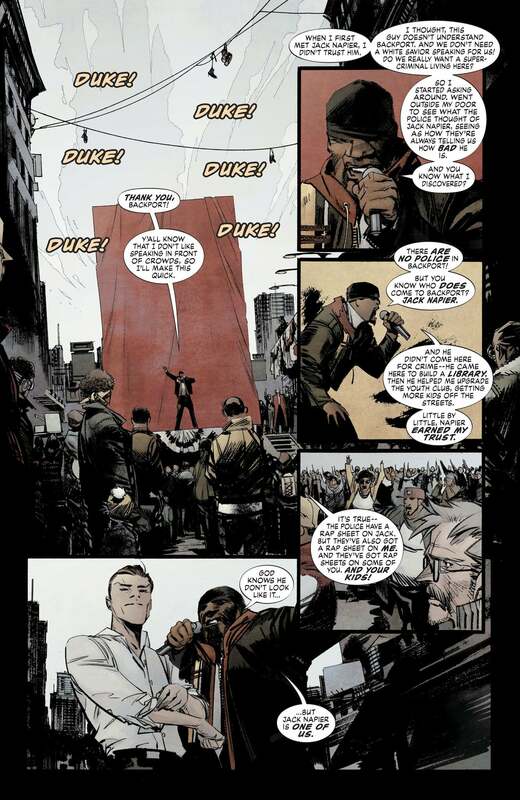 Having Napier travel into a black neighbourhood to begin his crusade against Gotham's unofficial symbol for the police's evil is a knowing, purposeful choice, but it belies the realities of how black people actually relate to authority figures who've been in positions to change our lives, especially in a political sense. If a white man with a decades-long history of terrorising a city attempted to convince that city's black population to vote for him in an upcoming election, he'd be laughed right off his campaign rally stage. White Knight presumes a kind of forgiveness from the people of Backport that's at odds with the reality of how people actually think and act, which would be fine, were it not for the fact that the comic is trying to tap into the realities of our world on some level. All of these issues are compounded by the fact that the final issue of White Knight is an uncharacteristically rushed series of events that lead to a deeply disappointing ending. 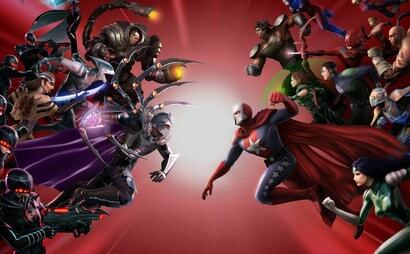 As the series draws to a close, Batman and Napier are forced to team up with one another in order to stop Neo Joker. She acts as a kind of Harley stand-in in the series until she replaces the real deal. Neo Joker winds up using the Mad Hatter's mind control headband to force Clayface's disembodied head to control all of Gotham's villains, who just happen to each have a piece of his clay inside them. Besides that - which is a lot on its own - Batman and Napier must stop her larger plan, freezing Gotham, which she will do unless her demands to see the Joker again are met. The pair meets her at her base of operations, and because she's so surprised to see her beloved Joker, the clown is able to get an early potshot on her that breaks her control over all of Gotham's villains. Free from Neo Joker's influence, Clayface proceeds to destroy everything around him, prompting everyone to hop into the closest vehicle and attempt to escape through a narrow stretch of road that the Batmobile can't fit through. 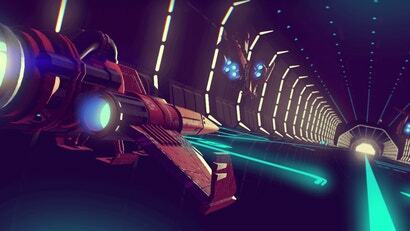 As Napier and Harley come to the realisation that one of them's going to die, Neo Joker pulls up alongside them and offers one of them a ride on her rocket, which can fit through the passage. It's all silly and dramatic and high octane, but it feels very much like a last-minute idea that was tacked on in order to punch up an otherwise bland denouement. 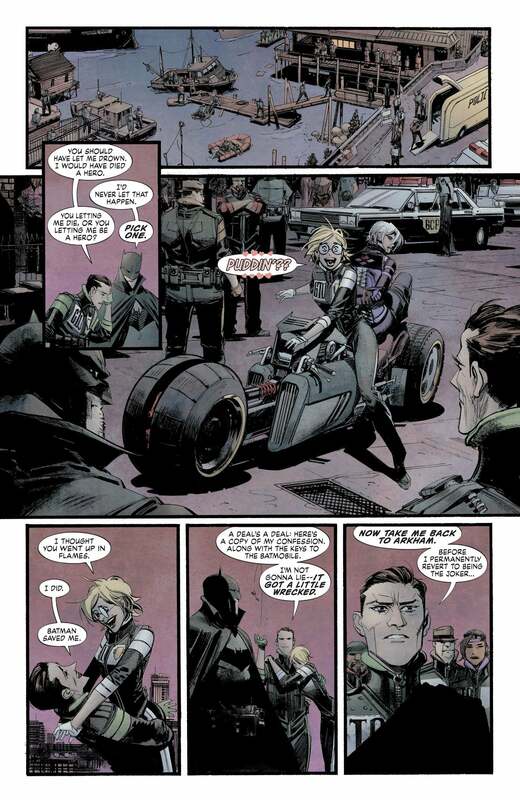 Harley ends up being the one to ride shotgun with the Neo Joker, leaving Napier to seemingly crash to his death in the Batmobile. And when the two women are clear from Clayface, they duke it out because, of course, everyone wants to see OG Harley fight her imitator. In an entirely unsurprising twist of events, Harley bests Neo Joker and stabs her before bringing her back to Gordon where she's pleasantly surprised to learn that (shocker) Napier is also still alive. 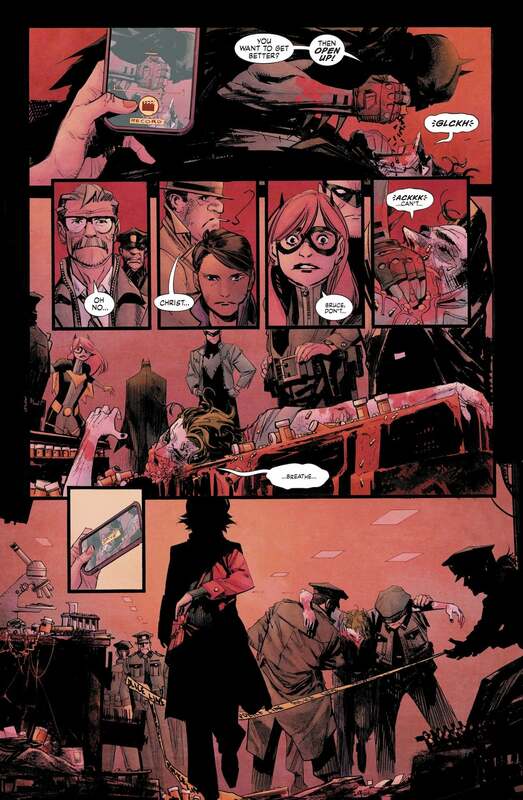 As a reward for his assistance in stopping Neo Joker, Gordon places Napier into a more comfortable cell in Arkham and agrees to legally marry him to Harley before he inevitably reverts to his old Joker persona. After the Joker's locked away once again, Batman reveals to Harley that he knew that she was the person who developed the drugs that temporarily cured the Joker and that the entire scheme - Napier's recovery, his political campaign, the staged attacks - was actually her idea. Rather than taking her in right then and there, Batman makes the most out-of-character decision of all and chooses to finally work with the Gotham police in an official capacity. After handing over the keys to multiple Batmobiles for the GCPD to use, the Dark Knight pulls off his mask in front of Gordon, reveals his identity, and says that he's ready to join him in the fight against crime. What's impressive is that even with these critical and perplexing flaws, White Knight is still an interesting story apart from the very last issue. There are subtle shades and nuances to Napier and Harley's relationship that, frankly, we've just never really seen in Batman comics before. In Bruce's grim descent into his own kind of madness, White Knight finds a heartbreaking tenderness that, pays off in a satisfying way when you learn Alfred's final words to Bruce. For all of its promise to go down as one of the more fascinating tales about Batman's life, White Knight's failure to stick its landing holds the series back in a significant way; its inability to meaningfully engage with the real world politics it was trying to tap into didn't help matters. Batman: White Knight might not be a perfect story in the end, but it was certainly a fun one. Seriously, what the hell happened? They have tried to condense an interesting idea for the sake of getting it done, when it really needed to have 12+ issues to really flesh out an interesting story. It was sooo good for the first six issues.